GIF was the much anticipated feature that appeared on WhatsApp in October 2016. With this new feature we can now send GIF images on WhatsApp. However WhatsApp takes these images as video files. With further updates the many GIF images came as part of WhatsApp. Now we don't have to manually search and share GIF images because WhatsApp has got its own GIF library built into it. It is quite quick to share since we don't have to search and share in the chrome browser. Now most android phone's use the stock Google keyboard which is now known as Gboard. 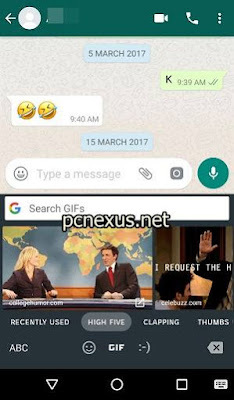 With older versions we were unable to insert GIF images from Gboard in WhatsApp chats. Doing so always thrown an error as "this text field does not support GIF insertion from keyboard". Now with the newer version this error doesn't appear anymore. We can now successfully use Gboard to search and insert GIF images into WhatsApp chats. For this you don't need to open the Google app or chrome browser and the search will occur in the keyboard app itself. 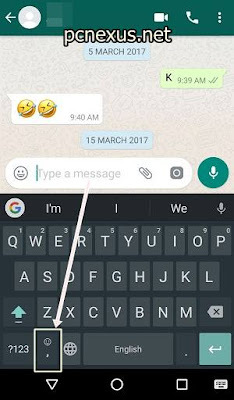 Open any chat and tap the text field to open the Gboard. Now long tap the 'emoticons' key on the keyboard. Tap the 'GIF' option and insert the images of your choice. You can also use the in-built search option to find more images.